Recovery Café’s community room is airy and inviting, lit almost entirely through large windows and skylights. The front desk is adjacent to the main entrance, not in front of it, offering a clear path from the door to the buffet. After the smile you can get a lot more. In addition to hot meals, Recovery Café provides long-term support, stability and expert guidance to help people struggling with homelessness, addiction and mental health challenges navigate social service resources. The Café first opened in 2004 in Seattle’s Belltown neighborhood, where its success led to expansion and a move to South Lake Union in 2009. First-time visitors are “guests,” Coffey explains. Once signed in you are welcomed to enjoy a meal, attend a class, use a computer, phone and talk with staff to connect with resources. Following the initial visit, you are invited to become a member. The only requirements for membership are 24 hours of sobriety, contributing to the Café’s operation and attending a Recovery Circle—small, loving accountability support groups led by trained facilitators. “This is a place where people feel safe,” Coffey says. Near the buffet, is a computer station and reading area. The community room is ringed with smaller meeting spaces offering everything from yoga classes to parent support groups and 12-step meetings. 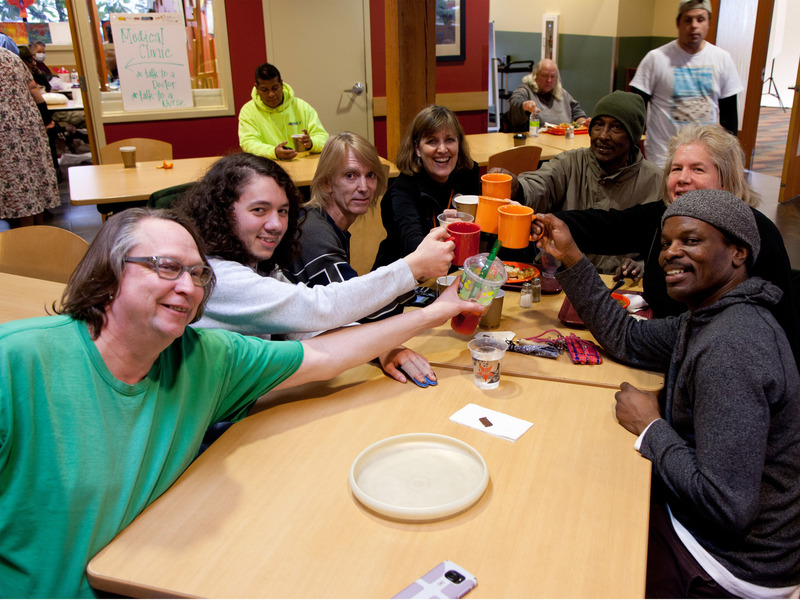 The Café’s team is committed to creating as many pathways to recovery as possible. The roots of Recovery Café stretch 33 years and 2,500 miles back to Washington D.C., where Killian Noe and David Erickson founded Samaritan Inns to assist people struggling with homelessness, addiction and mental health challenges. When Noe moved to Seattle in 1999, she visited local nonprofits and care providers, learning about available services and gaps in the safety net. Assistance was available, she found, but the missing piece was long term recovery support. With that in mind, Noe and two other founders, Dr. Ruby Takushi and Mary Crow, began to create the model that is now Recovery Café. Today about 1,000 people come through Recovery Café each year. Those members contribute about 13,000 total hours to keep the cafe running. And why did Recovery Café join the Downtown Seattle Association? The Metropolitan Improvement District is especially valuable, Coffey notes, serving as a platform to lift members from homelessness to employment and stability. It is one of the reasons he serves on the MID Advisory Board. The Café’s success has led people from around the country to reach out for advice on creating their own long-term support organizations. The interest sparked the formation of Recovery Café Network in 2016. Today, 11 other communities from California to North Carolina are operating or are in the process of opening a Recovery Café . The Recovery Café Network was recently featured in the national magazine Sojourners, and they anticipate launching a new learning cohort of different communities seeking to replicate this model every six months.